Several things should raise your suspicions about the legtimacy of this message? 2. Very poor and awkward English. That’s not to say that non-English speakers in the U.S. don’t need or want tutors, it’s just important to note because English is not the primary language of many of the scammers we have been notified about. 3. 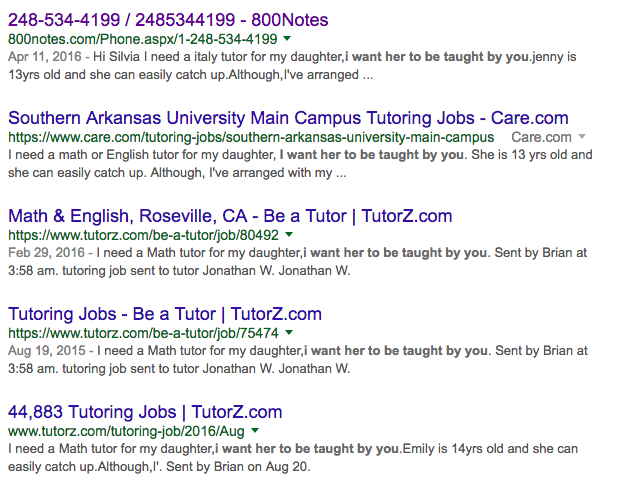 We have spoken to tutors who offer their services through some of these websites and they say it is very odd for someone to ask for the cost of “tutoring for 1 month” at a time. However, the phrase that most caught our attention was “I want her to be taught by you.” It’s odd for someone to say that to a stranger who has been contacted for the first time over an email. We Googled that phrase with quotes around it (meaning to find exactly these words in this order) and the results were not surprising. We found four other nearly identical messages as the message from Kenneth Jose but coming from different names and about different children. So what’s the scam here? According to Alicia who posted on 800Notes.com the “parent” sends a check in advance for tutoring services but mistakenly the check is sent for the wrong amount of money or there is a mix up of checks. The tutor receives a bogus check for more than the agreed upon fee. The tutor is asked to deposit the check (immediately), keep his/her lesson fee and send the remaining dollars back to the parent or his/her representative. The “parent” may even pressure the tutor by having his/her “attorney” call and ask why the money has not been returned. Of course the check is fraudulent but so well designed that it will take your bank about a week before the fraud is discovered. In the meantime the scammers are hoping that you’ll think the check has cleared in two or three days and send them your hard-earned money through a method that cannot be stopped such as Western Union. This is just a clever variation of the scams that are plaguing members of Care.com. If you see this scam in action and can give us names, email addresses or phone numbers used by the scammer, contact us at spoofs@thedailyscam.com. The Daily Scam has received the following updates from different tutors reccently…. A potential new student has contacted you from your profile on UniversityTutor.com! Hello, I need an Algebra 1 tutor for my Son,i want him to be taught by you.Samuel is 12yrs old and he can easily catch up.Although,I’ve arranged with my caregiver that my Son is coming to stay with him for his period of tutoring and he had agreed with me. I want you to email me back with following information: your area of residence,total cost of tutoring for 1 months (1 hour per day 3 times/week),your years of teaching experience. Expecting your prompt response. Regards.. The scammer made contact via text from 1 815-785-0947. Every message was signed with “-Sent free from TextNow.com”. After doing some research, I found out a person on facebook called “Katy Cole” was doing the same scam. She claimed that Brainwhite was her husband. Tutors on TakeLessons.com are supposed to keep all communication within the TakeLessons website and not communicate off-site. Notice how “Jose” lists his email with spaces between the letters to avoid being picked up by software sensors. And notice he is willing to pay $50 per hour! And who the heck asks for algebra tutoring for a 5th grader anyway?? You just received a question from a potential Algebra student. Reply ASAP while this student is still interested! Jose asked: Hello, i am interested in your tutoring service for my daughter, she is currently in grade 5 and she needs help with Algebra, i am willing to pay $50 PER HOUR. Kindly send your resume to my email on J O S E W I L K E S @ G M A I L . C O M if you’re interested . We have an important update about the tutoring scams that have been reported to us over the last few weeks. While it was very clear to many people who offered tutoring services that some “parents” contacting them seemed very suspicious, it wasn’t clear to them, or us, how the scam played out. 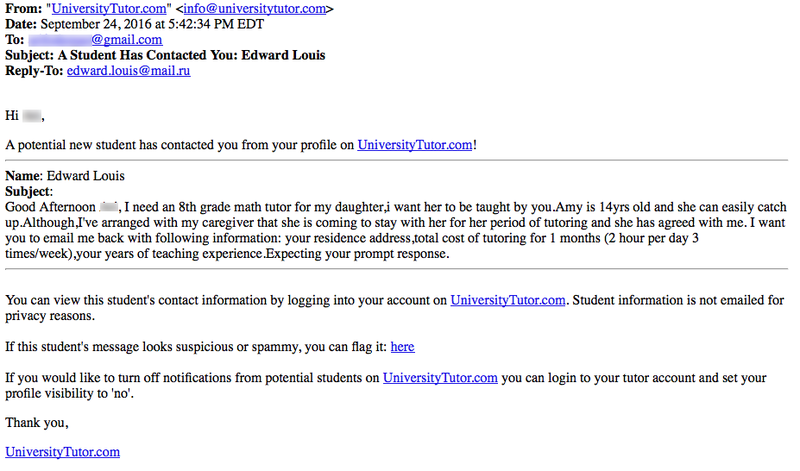 So we decided to jump in and contact one of these parents looking for a tutor! Robinson, You contacted me on TakeLessons.com and asked about learning Spanish. When did you want to start? Red flag: Keep in mind, Robinson had never contacted Cory. How about your Availability ? My schedule varies somewhat during the week since many of the kids I tutor want to meet right after school. Weekends are more flexible. Did you want a tutor to come to your home? If so, where are you located? Or was this to be online only? I can do both. Also, if you want to schedule a regular time each week for several weeks I can do that for late afternoon or early evening. Let me know your preference. Red flag: Robinson avoided Cory’s questions and then asked her to give her location. Book a hotel for his kids? Seriously? And then says that he will pay through a cashier’s check! Friday through Sunday would work out very well for me! I charge $45/hour for tutoring per person. I would be happy to tutor both your children together for $60/hour. We could meet once on Friday afternoon, and once Saturday and once on Sunday. There are no transportation fees if I don’t have to drive more than 20 minutes to get to you. Cory responded with a cell phone number. Why are you sending me a check already? We have not set up any tutoring time, I have not met you or your children yet? How much is the check for? We need to agree on certain things about tutoring your children before you pay me in advance. I think payment first and after that we will be able to know where and I talked to my children nanny and said thursday through saturday or monday through wednesday is ok … well I will have to ask my secretary shes on vacation aint tell me anything about the amount all said is that the payment has been made … well tell me where is convienent for you and what times let me know asap ..
How much is the check for? Hi Cory Meadows, This is Robinson Sample and am texting you to info you that your payment is in Transit and its going to be delivered tomorrow, Kindly text me back once you get this text..
Cory: Robinson… How much is the check for?? BINGO! Robinson reveals the scam! He has sent a fake check that is far greater than the payment Cory might expect to receive. We’ve seen this scam dozens of times before targeting Care.com members. Robinson will ask Cory to desposit the cashier’s check and return a portion of it that is more than her expected payment. Eventually the check will bounce and Cory will have sent her real dollars to this scammer.